The shine on Dark Cabinets: New Caledonia Granite Countertop. Wise New Caledonia Dark Cabinets Backsplash Ideas is in kitchen remodeling. New Caledonia’s pattern brings perfect results. Backsplash selection for dark kitchen cabinets would be fun and easy with New Caledonia Dark Cabinets Backsplash Ideas. My followers love my writing style so I will keep it same for your review: First the name and the characteristics of the backsplash, then the color and stain of the dark cabinets under each pictures. In New Caledonia Dark Cabinet Backsplash Ideas, the backsplash colors are simple as ivory and very pale gray tones. Ivory and pale gray backsplash seems simple but they won’t go wrong with your decision. Homogenous patterned countertops are very flexible for backsplash selections. Sometimes dark gray backsplash would be picked if the kitchen is large and catching the sunlight or ample lighting is around. Inserting the borderline in the backsplash is always fancy and New Caledonia Granite Countertop carries this elegant look very proudly while the dark kitchen cabinets are installed. Kitchen remodeling needs always contrast and these cabinet, backsplash and countertop trio makes your dream kitchen true. If you need more pictures about New Caledonia Dark Cabinet Backsplash Ideas you may check one of my previous article. Wisdom of Gray: New Caledonia Granite Countertop. The material for the backsplash can be ceramic, travertine, granite or marble. The type of the backsplash tile would be subway, mini subway, matchstick, 4×4 Square, and mosaic. Fun and satisfied selection of backsplash for New Caledonia Granite is on the stage. Below are the selected pictures of New Caledonia Dark Cabinets. Picture Credit: By Design LLC. and SeaSaw Imaging, New Caledonia Granite Countertop with Travertine Subway Backsplash and Some matchstick backsplash borders. I love the smooth brown colors on the cabinets. Stay tuned , I will come up with all the details. Picture Credit: Home Center Construction, Aged stain cappuccino cabinets with New Caledonia Granite Countertop and lovely embellished backsplash. I think, backsplash is granite too. Hickory hardwood flooring with aged stain gives the kitchen deepness . Stay tuned name and color codes are on the way. Such a good example for New Caledonia Dark Cabinets Backsplash Ideas. Picture Credit:Dietz & Associates Inc. and Matt Baldelli Photography. This contemporary kitchen has a great taste to put the all design element together. 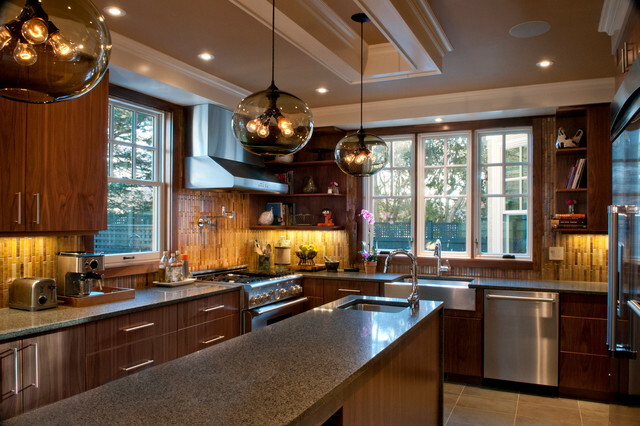 Vertical set up rectangle backsplash , shiny finish brown cabinets and long islantop with New Caledonia Countertop embellished with transparent sphere pendants. Stainless steel appliance makes the kitchen bright. Ceiling is very fancy called coffered ceiling. Picture Credit: Cypress Design Co., The color contrast in this traditional kitchen gives you fresh and bright look. The backsplash tile is from Dal Tile and the line is Florentine/Color is Carrara/Size is 2″x4″. The cabinetry is Waypoint Living Spaces cherry with a spice finish. Stainless Steel appliance is a good addition to complete the freshness. Picture Credit: DanRic Homes via Houzz., and Philip Darden Photography. Integrity Sedona Cabinets in Ebony finish is dark enough to pop the granite countertop New Caledonia. The floor is Mohawk Forrest Lakes in Oak Oxford. Big square ceramic tiles is used for backsplash. Freedom is in the kitchen. Lovely.